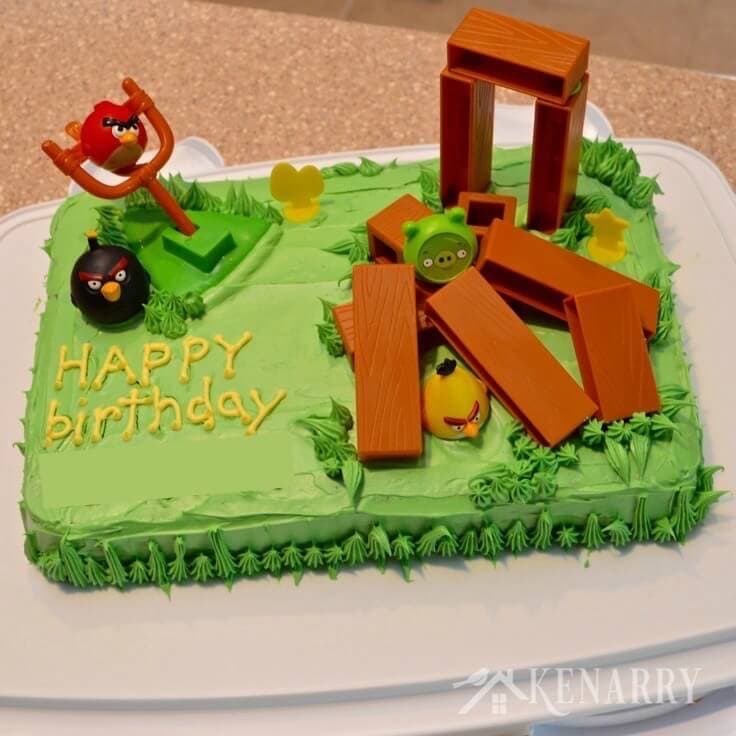 Create an Angry Birds Cake for your child’s birthday party by using game pieces and green frosting. 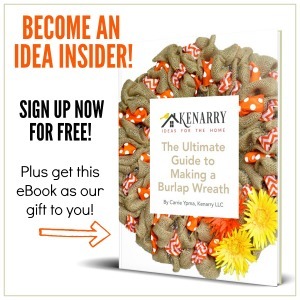 It’s a super easy idea that will delight your children. Several months ago, I shared how my son wanted a “Puzzingo” the clown birthday when he turned five years old. “Puzzingo” is a character on an iPad game by the same name. I love a creative challenge so I set to work designing Puzzle party favors for his school birthday treat and scheming about an idea for a “Puzzingo” birthday cake. I love making fun birthday cakes for my boys. As his birthday got closer, I thought I’d come up with the perfect idea for his cake. I was going to use a 9 x 13″ cake pan and various shaped tin cans to mold the cake into the shape of a giant puzzle piece. It was going to be SO cool and blog-worthy! The kind of cake other mothers will admire on Pinterest, for sure. My pride was nearly bubbling over as I sat down to explain my glorious cake plan to C1, the birthday boy. I took a pen and a piece of paper and carefully drew a large puzzle piece shape to show him what I was thinking. He looked at me for a moment like I had two heads, then grabbed the paper and pen from my hand and said “Uh, Mom… why can’t you just make it cake shaped, like this?” I looked at the paper and saw he drew a very… simple… rectangle! 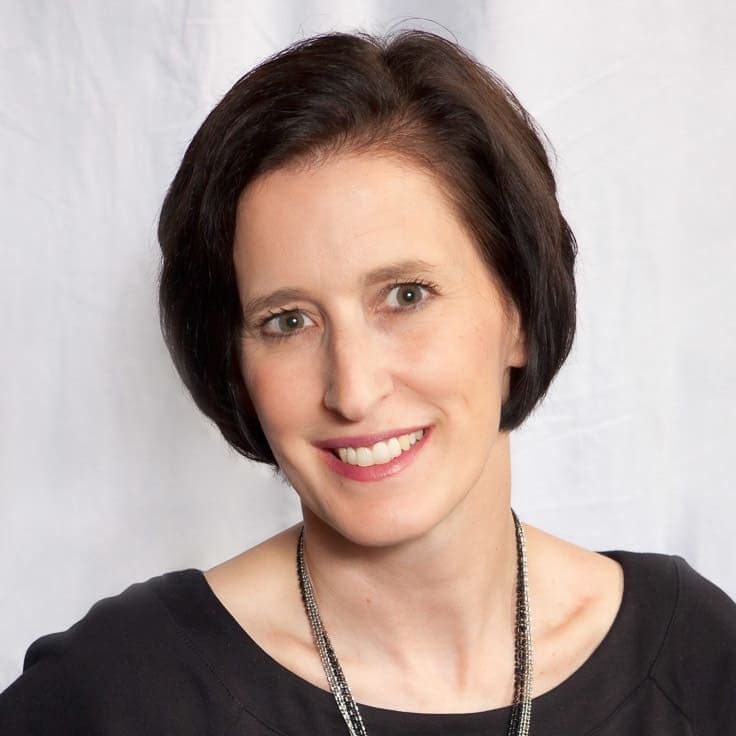 It was a great reminder about how we, as mothers, stress ourselves out trying to make things perfect and Pinteresting. We tend to overcomplicate things when all the kid wants is a simple birthday cake to make him feel special. And if that wasn’t enough to burst my bubble, he also said “…and can you make it Angry Birds instead?” Once I got over myself and started seeing things his way, I realized what he wanted was going to be so much easier anyway. Ultimately, it’s his birthday and his happiness about his cake is the most important thing. 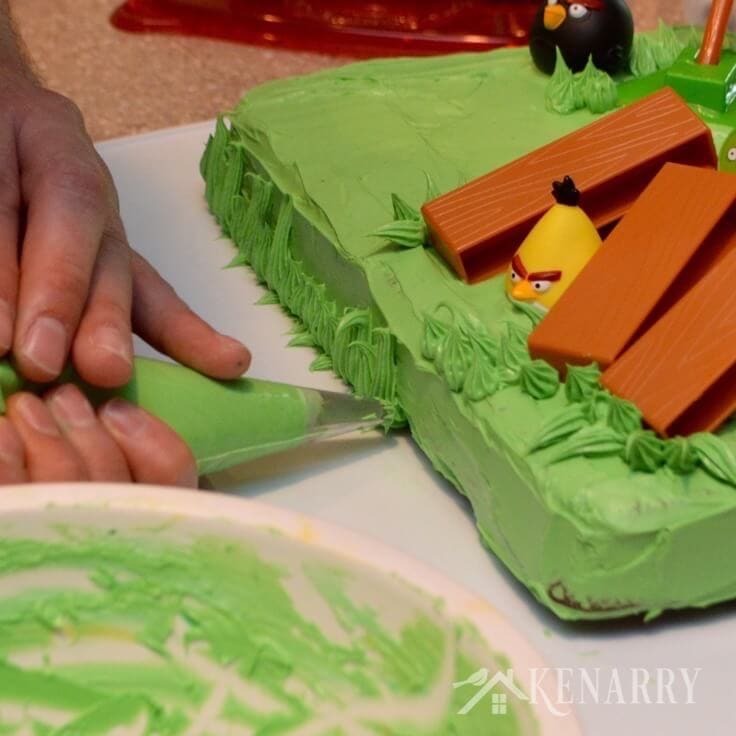 What makes this Angry Birds Cake incredibly easy is the use of plastic game pieces to create a scene on top of the cake. What makes it even easier is when your artistically talented little brother walks in as you’re about to decorate and takes over your project. 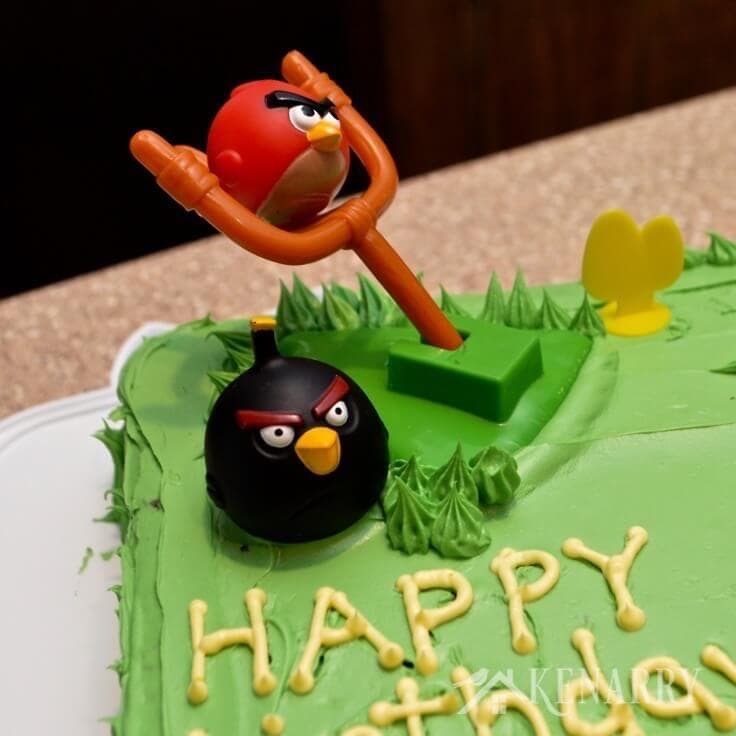 While I can take credit for the Angry Birds Cake idea, my brother gets full credit for the way it artfully played out on the cake. 1. Bake the cake. Follow the directions on the cake mix box to make a 9 x 13″ cake. 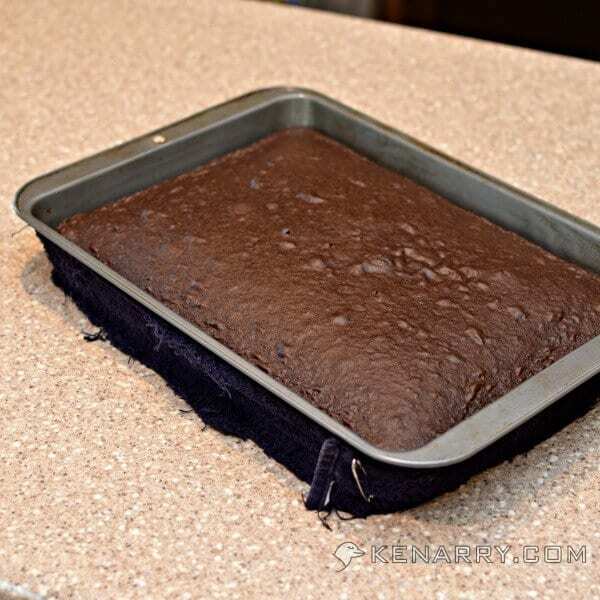 Tip: To keep the top of your cake flat, wrap your cake pan with a long strip of an old terrycloth bath towel. Before you wrap the towel around your cake pan run it under cold water and wring it out with your hands. Use a safety pin to keep the towel securely in place. As you can see in the photo below from the Muppet Birthday Cake I made for C1’s birthday last year, doing this helps the cake to cook more evenly. Otherwise the outer edges cook first causing the batter to rise in the center. with a lid so we could easily store the leftover cake later once we’d celebrated C1’s birthday and removed the game pieces. 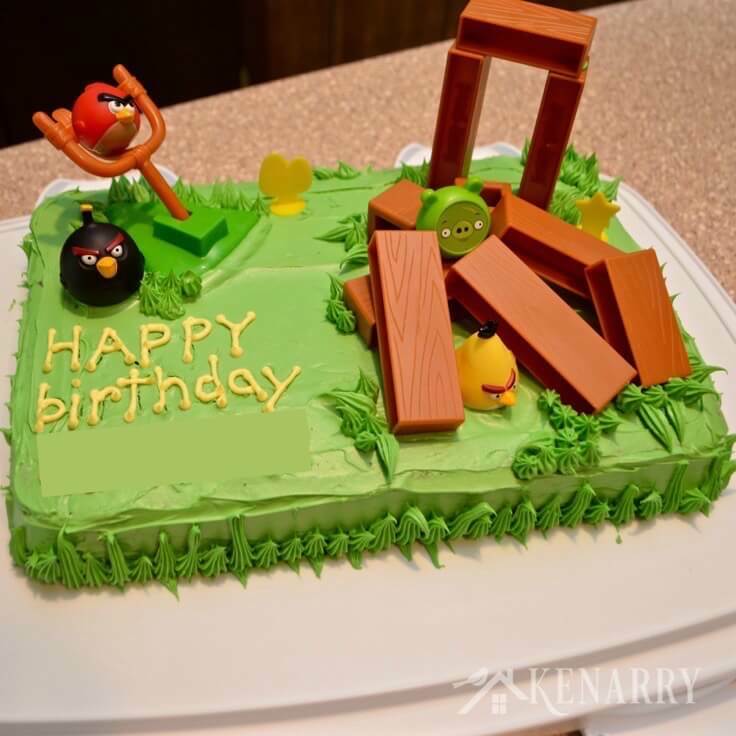 Mix white frosting with green food coloring to create the color of a grassy field. You’ll need to add a few drops of yellow and maybe even one or two of blue to get the same shade of green we used. Frost the entire cake with the green frosting. Don’t worry about making it look flat and perfect. You’ll also want to make sure you save some of the white frosting to use later for lettering on the cake. 3. 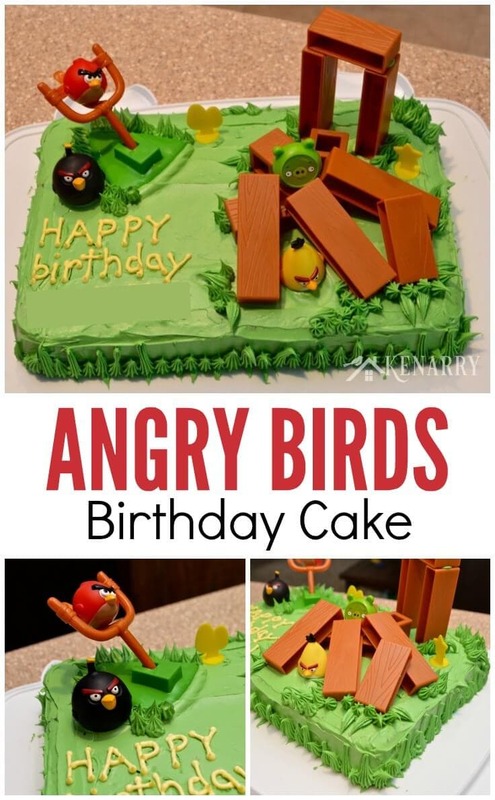 Place the Angry Birds game pieces. Next position the game pieces where you want them on the birthday cake to create a scene. 4. Create “tufts of grass”. Put a cake decorating tip into the end of a frosting bag and then fill it with green frosting. Start at the base of a tuft and then quickly and gently squeeze to create the little tuft of grass. 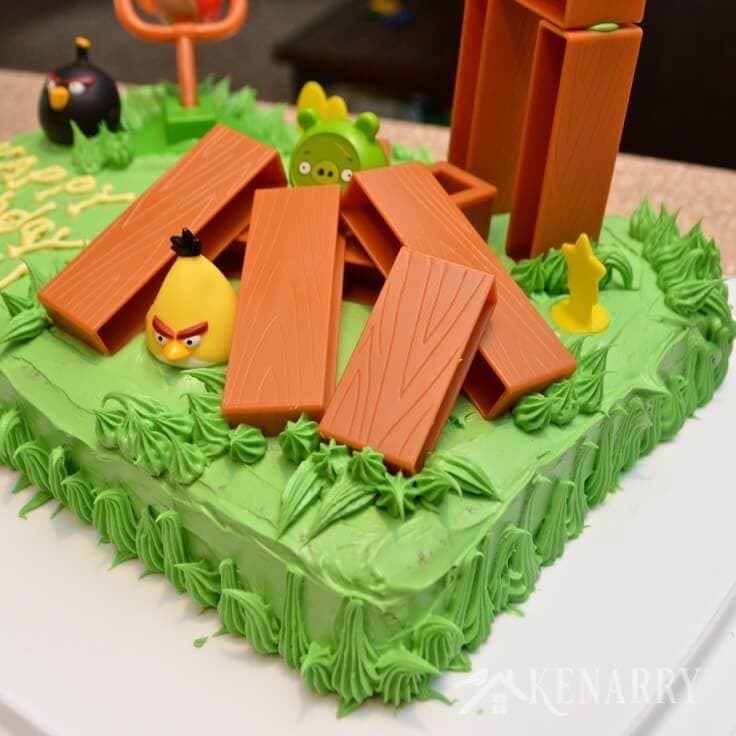 Add tufts of grass to trim around the entire edge of the cake. 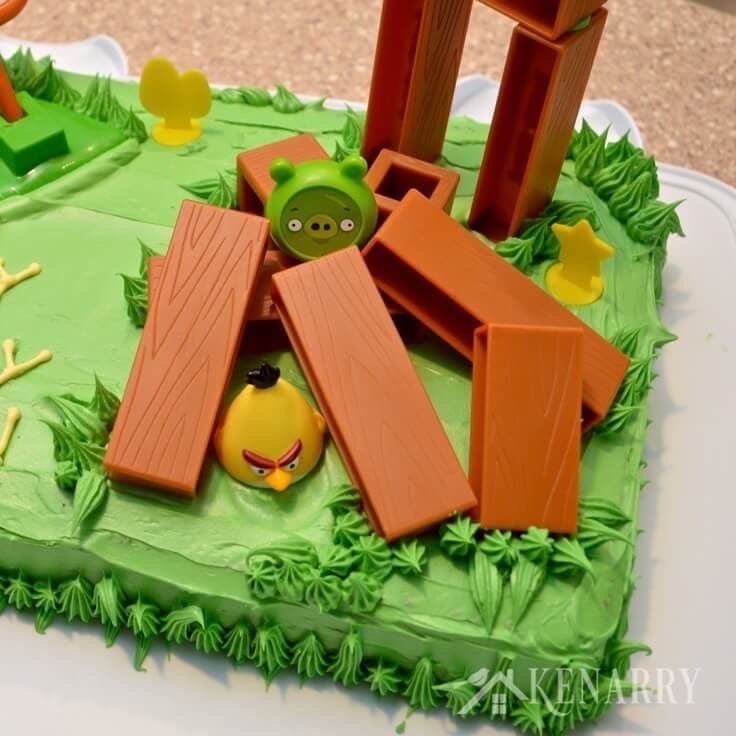 Then add tufts of grass around the game pieces on the Angry Birds cake. It’s meant to be whimsical and fun so just put the frosting tufts wherever you think they’ll look best. You can also see in the photo below that my brother used frosting as “glue” to hold some of the game pieces together to build them up and give it a little height. 5. Add “Happy Birthday”. Mix the remaining white frosting with yellow food coloring. Put another decorating tip in the end of a decorating bag. 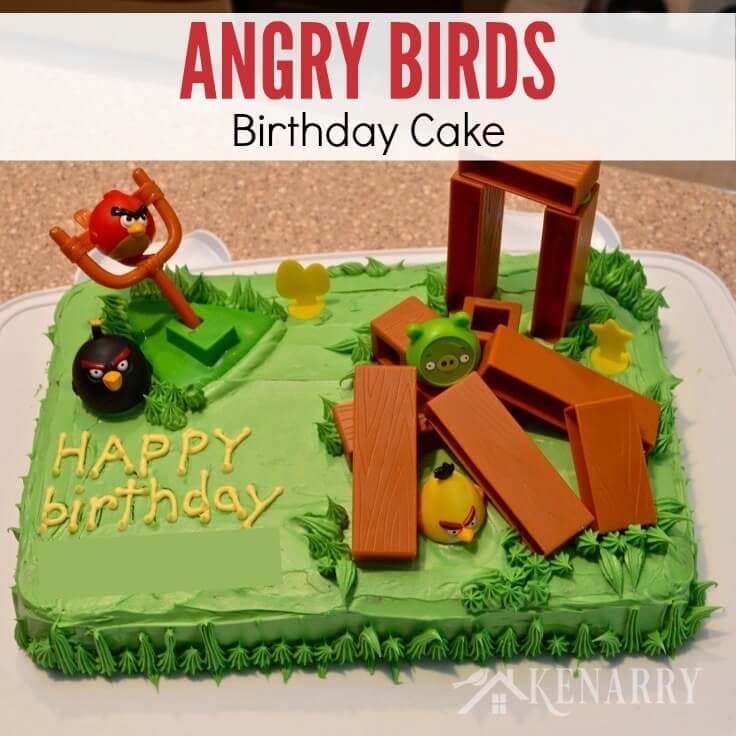 Fill it with yellow frosting and then pipe the bright yellow frosting on to the Angry Birds Cake to spell out “Happy Birthday” along with your child’s name, if you desire. 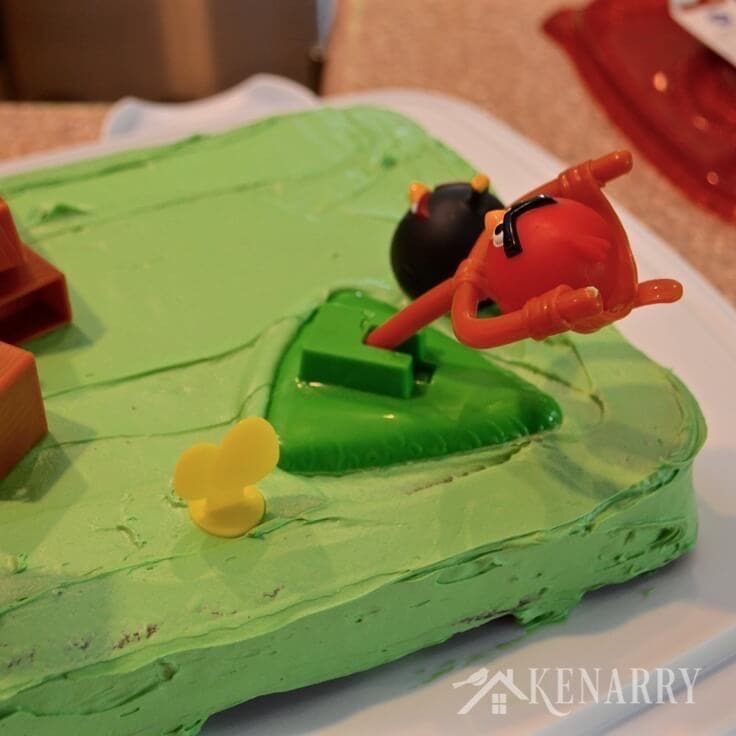 Afterwards it was really easy to clean up the game pieces from the Angry Birds cake since they were all made of plastic. We just wiped them clean with a little soap and water and used a toothpick to clean out any extra frosting in the crevices. The Angry Birds Knock On Wood game was as good as new and ready to play again another day.